Men gather on an elevated highway near the smoking remains of an explosion in northeastern China's Tianjin municipality, Aug. 15, 2015. 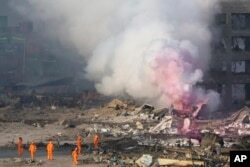 Chinese authorities ended the search for the remaining eight missing in a massive chemical warehouse explosion last month, setting the final death toll at 173 in China's worst industrial disaster in years. The announcement on the Tianjin city government's microblog said there was no hope of finding the eight people, and the court will now start issuing death certificates. "After thorough investigations by all parties, it is certain that there is no possibility of survivors,'' said the statement, posted late Friday night. The eight include five firefighters, underscoring the explosion's status as the worst ever disaster for Chinese first responders, more than 100 of whom were killed, including police officers. Among firefighters, a total of 104 were killed. Fire fighters in protective gear watch partially pink smoke continue to billow after an explosion at a warehouse in northeastern China's Tianjin municipality, Aug. 13, 2015. Investigations into the Aug. 12 blasts at the Ruihai International Logistics warehouses showed they were located closer to homes than permitted, and stored much more hazardous material than authorized, including 700 tons of highly toxic sodium cyanide. A series of massive explosions late at night shattered windows and tore facades off buildings for kilometers (miles) around, while launching debris including heavy steel storage canisters into nearby communities with the force of an artillery shell. Disgruntled homeowners have held numerous angry protests demanding the government buy back their apartments, saying they are unlivable. The disaster has raised questions about corruption and government efficiency, potentially tarnishing the communist government led by President Xi Jinping, who has made those two issues a hallmark of his administration. 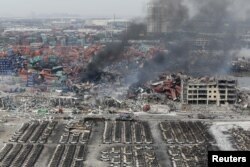 According to the Tianjin Environmental Protection Bureau, water samples inside the disaster zone have shown levels of cyanide as high as 20 times above that considered safe. No cyanide has been detected in nearby seawater or areas outside the 3-kilometer (1.8-mile) radius quarantine zone.